Stephen Dupont is an internationally acclaimed, award-wining Australian photojournalist, and filmmaker whose work centers on global changes caused by war, violence, and other social and cultural upheavals. Dupont's self-published artist's book Raskols documents Papua New Guinean youth in crisis-men and boys who have turned to crime, violence, and anarchy in a bid to survive within a gang-dominated urban social order. 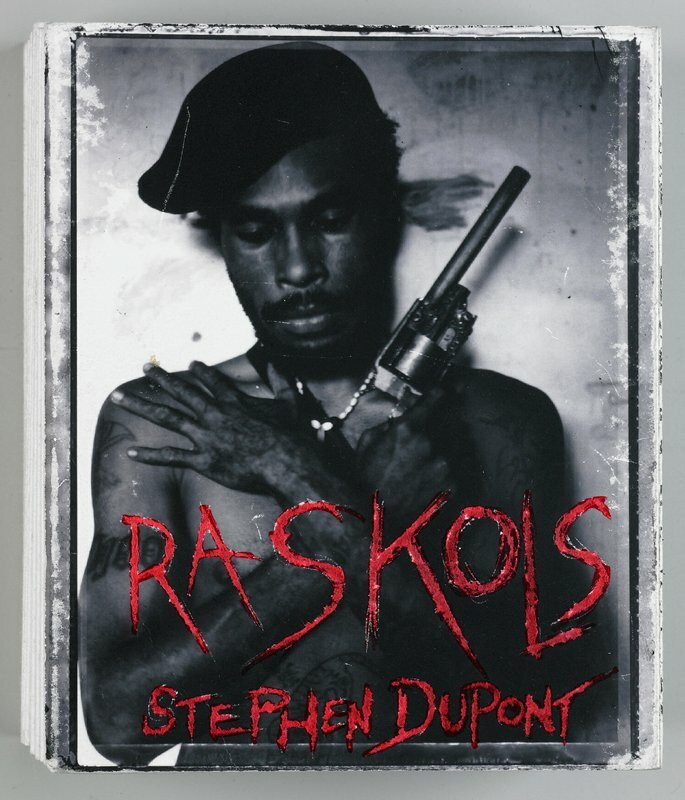 In 2004, Dupont befriended members of a raskol (gang) in order to document the individuals behind the facelessness of gang warfare. His compelling book offers an extensive series of portraits of members of the Kips Kaboni (Red Devils), the largest and oldest of the numerous street gangs active in the capital city of Port Moresby. Using a Polaroid instant camera, Dupont photographed gang members as they chose to be seen. His images are at once mesmerizing and unsettling, particularly from the perspective of outsiders, who may at first see only the spectacle of gang members posing as armed and dangerous "criminal heroes." To counter such self-glorification, Dupont inserts brief hand-written texts citing Port Moresby's annual crime statistics, a potent reminder of the human cost of violence.